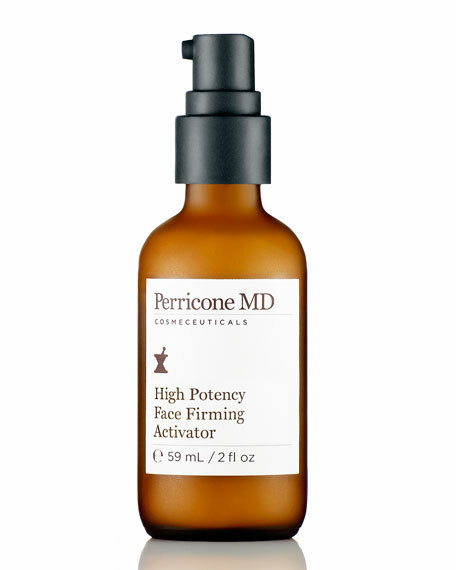 Perricone MD High Potency Face Firming Activator, 2.0 oz. Perricone MDHigh Potency Face Firming Activator, 2.0 oz. A high power treatment, High Potency Face Firming Activator, designed to minimize wrinkles, pores and surface imperfections. High Potency Face Firming Activator, previously available only through dermatologists, is designed with the highest potency active ingredients to minimize the length, depth and width of a wrinkle while delivering a luminous, vibrant, fresh complexion. Alpha Lipoic Acid. Powerful fat and water-soluble antioxidant helps to increase levels of other antioxidants in the skin. It repairs the depth of a wrinkle by addressing the micro-scars beneath the skin surface. DMAE. Tackles the length and width of a wrinkle by lifting, firming and pulling the skin taught. It works synergistically with Alpha Lipoic Acid, both proprietary to Perricone MD. NTP Complex Delivery System. Dr. Perricone's patented delivery system works to ensures optimal results by driving actives deep within the skin. For in-store inquiries, use sku #1508897.